Nicht destotrotz ist meine neue Maggie von Sugar Nellies ein absoluter Hit. Ist ihr Kleid nicht ein Traum? Ich habe sie mit meinen Caran D'Ache Supracolor Stiften und Twinkling H2Os coloriert (vergeßt nicht auf mein Video Tutorial, das morgen online geht. Ich habe es endlich fertig bekommen :) Ein paar Details und die Flügel habe ich mit Spica Glitzer Stiften versehen. Dann habe ich noch Stampin' Up crystal effects unter ihre Füße getan und Glitzer hineingestreut (soll wie frischer Schnee aussehen). Ich habe wieder ein bisschen rund um die Karte genäht und meine Cuttlebug embossing Schablone "Swirls" auf dem cremefarbigen Streifen angewendet. Nevertheless, I absolutely loved my new Maggie of Sugar Nellies. Isn't her dress sensational? I coloured her with my Caran D'Ache Supracolor pens and Twinkling H2Os (Don't forget about my Video Coloring Tutorial, which will be up tomorrow - I finally got it ready :) Some details and the wings were highlighted with my Spica Glitter pens. I then put some crystal effects at the bottom and added some glitter (should look like some snow). I did some sewing around the background paper and used my cuttlebug embossing folder "swirls" for the cream-coloured cardstock. Accessories: ribbon Stampin' Up, brads Rayher, Su crystal effects, glitter, cuttlebug embossing folder "swirls"
another great card. love your creations. Diese Art von Karten errwartet man wirklich nicht um diese Jahreszeit. Umso mehr freut es mich, mal nicht eine typische Sommerkarte zu sehen, sondern mal was anders. Katharina die Karte ist wunderschön, ein edler Touch. Gefällt mir richtig gut. Gorgeous, love the stamp and the elegant layout of the card. You made a fantastic christmas card even though you weren't in the mood! It is so beautiful and doesn't Maggie make the perfect Christmas Fairy? Katharina, Du überraschst einfach immer wieder - aber positiv - die Karte ist ein Traum - so edel, elegant und harmonisch - unheimlich schön ! Fab card Love this new maggie stamp. She is so cute. Love this card. Das ist ja eine Traumhaft schöne karte, auch der Stempel ist ein Traum den muß ich unbedingt auch haben. Ich habe mich sofort verliebt. This is such a lovely Christmas card Katharina! Nice to start them early so the last months before Christmas don't get to busy! Thanks for nice words at my blog lately! And I would love it if you tried to play for my blog candy! How beautiful is this! Ok, to start she is darling, and her dress is wonderful. I love the sewing it adds so much to the card, the ribbon is wonderful perfect for a Christmas card! It is all wonderful as always! you got it right Katharina, this whole card is sensational!! love the glitter and that beautiful fairy, so pretty!!! Fabulous card Katharina, I love her dress and the glittery snow effect - makes me feel quite festive on a cold wet day! 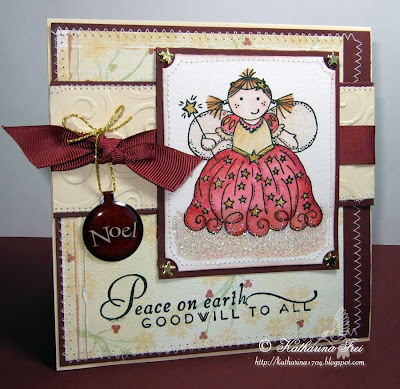 This is a Gorgeous Christmas card Kartharina!! it is an absolute stunner...and I love the accents!! Love your new card, love Maggie in her big dress. Well it might have taken you ages Katharina, but it was certainly worth it! You have created a beautiful card with princess nellie! Ooooh, I feel all christmassy now! Beautiful!! I love your your stitching! I should get my holiday cards started now too - great idea! !